Relatively quiet day yesterday with a bit of small fireworks at five from the client. Nothing impossible, just hard as I always feel like the branding junkyard dog telling the client who owns this mark and identity that they cannot do certain things. Definitely feel like the odd man out regularly...and then, taking a breath and saying okay...though I have expressed "the line" on brand, their brand, their guidelines..which gets me through that. Generally, there is a ton of work arounds and clean ups around these unconsidered rule breaking. But hey. Thats what i get paid for. 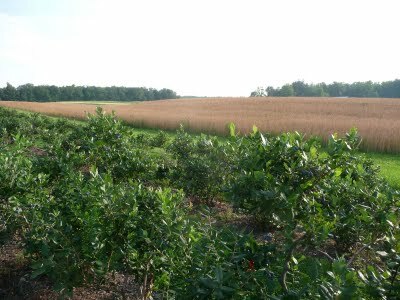 Maddie (my short term intern), Kitty and I went blueberry picking around 6 last evening. It was a glorious evening with breezes and clear skies. We went to Loses Blueberry Patch (signed with some great handlettered arrows), driving down a dirt lane by a pair of goats sitting on top of their goat house, and a golden grain field surrounding us until we got to the blueberry patch. 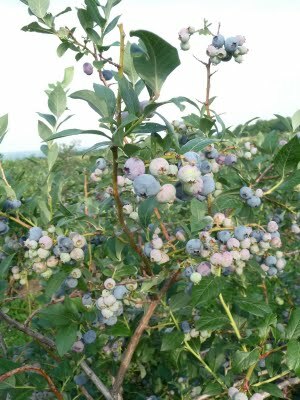 The bushes were glorious and filled with ripe berries (and all levels of berries getting to ripe from pea green to olive green, from pale pink to a brilliant fuscia, to all shades of blue to a shiny purple plum color). It was perfect. We got some small buckets and communed with the laden bushes (rare for me as I always time it that we go at the end of the season and have to glean the dregs). You could just run your hand through the branches with the bucket poised underneath and the berries dropped happily. After a half an hour, we had between the three of us, picked 17 pounds of berreis ($1.65 a pound). So, we are happily eating, freezing and dreaming blueberries. Kitty was musing over children's books and how she would use a blueberry and its transition from a hard green sphere to a ripe shiny berry as a way to express Beauty in Beauty in the Beast. I thought that was an interesting insight. Maddie and Kitty and I talked about food, food in countries they have visited and our plans for our cache. Maddie is busily registering/copywriting my illustration. It appears to be easier than it seems as images we have used for the website work (note to self, keep a folder on the desktop of images going on the blog or web for future posting). We have also mounted pdf files of images (Memento Mori, my thesis) as a way of capturing images in their entirety. Something to think about. My classmates from Hartford are settling back into their lives and are talking on Facebook about their work and plans. We graduates are laying back a bit...trying to shift into the new chapter. To be honest, I am having a bit of a traction problem as i cannot really get it going right now. I want to draw and do stuff, but I am a bit stuck in the mud. But, as the program has pointed up, this stall is part of the process. Time and marination is in place. I just was called about a winelabel for three very sweet (read very popular wines) that are marketed under the Banana Belt name. The Banana Belt is a swathe of Seneca Lake that has a very distinct climate zone "tropical" thanks to the geography of how the land interfaces with the lake. As you know, lakes are a real moderating force whenit comes to weather and climate...with the steady temperature controlled by the the very deep waters and it's temperature of the lake. Takes a lot to make it hot, takes a lot to cool it down. This is a lake that never freezes given the depth. So, back to Banana Belt. Its a pretty cute label as we speak...but Banana Belt reads first without a clear nod to red/white/pink WINE. Love the monkey that is on it...and maybe as the future client suggested, we look at fruit crate art (and my words, put a monkey with a wineglass--not a chimp like Travis from Connecticut, the lawnmower driving, chardonnay drinking, pill popping, hot tubbing monkey)--with a bit of a lakeview in the background? I have been noodling this and we will see. Could be a fun one. Today I work on a logotype for the Museum of Glass--and do some mom stuff (kid's doctor appointment). Maybe a swim in the divine lake this evening. We did that before dinner last night to all of our pleasure. This is really summer.